Lascaris Belvedere and the Amati Column. 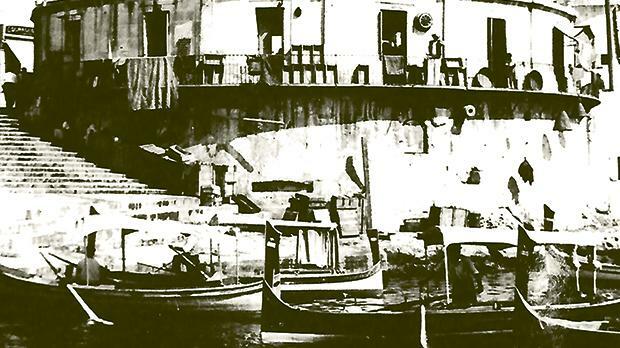 Before the opening of the Valletta ring road in 1978, Barriera Wharf, the waterfront between the Customs House and Imgherbeb Point, sandwiched between the Upper and Lower Barrakka Gardens, was a cul-de-sac which had endured relative isolation for 400 years. Traffic exited the capital from Strada Levante through Porta di Monte (later Porta Marina or Marina Gate) from 1571 to 1885 and, subsequently, from Victoria Gate. Inevitably, the road made Barriera Wharf a busy thoroughfare, burying its chequered history. Exploring it is immensely satisfying if only one heeds William Henry Davies’s advice in Leisure: “What is this life if, full of care/We have no time to stand and stare/No time to stand beneath the boughs/And stare as long as sheep and cows.” Substitute “boughs” with “bastions” and embark, with apologies to Marcel Proust on “A remembrance of things past” or, as his monumental novel was later rendered, In Search of Lost Time. Passenger and cargo wharves are port security areas, so only the shoreline between Fort St Elmo and Barriera Wharf is currently accessible to the public on this side of Grand Harbour. It is an idyllic location for staring; although the road level was raised in 1978, it is still possible to sit on some of the original well-worn steps leading down to the water. Long before the steps and the mole, it took sheer genius to create a fortified city from a rocky peninsula, Sceb-er-Ras, which straddled twin harbours, and whose highest point was a 140 to 170-foot plateau from which valleys (Manderaggio, Ghetto, Arsenal, Lazarus, St Lucy) sloped towards the sea. Francesco Laparelli and Ġilormu Cassar created Barriera Wharf from St Lucy Valley; they altered the topography beyond recognition, and left Imgherbeb Point as a reminder of the original peninsula. 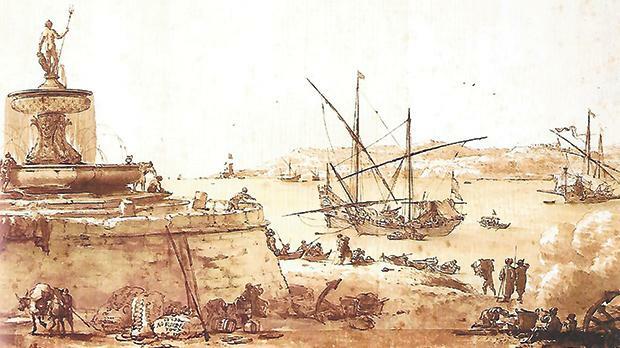 Valletta was separated from the rest of the peninsula by a ditch excavated at the highest point between the harbours. It was left to successive grandmasters to leave a lasting imprint, and to the British and Maltese to undo or alter it. Pietro di Monte succeeded de Valette, and Laparelli made him a gate at the foot of St Lucy Valley. 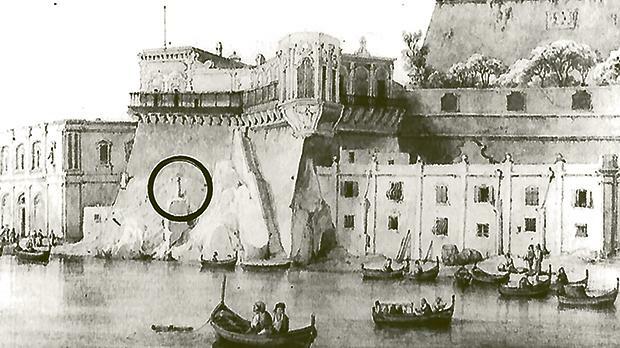 In 1615, Alof de Wignacourt brought water to the city and the waterfront, where he erected the Neptune fountain. (Il-Ġħajn tal-Ġgant – the Giant’s Fountain; the area was also called Fuq li-Ġgant). Dr Giovanni Bonello dispelled long-standing myths about the Neptune; he proved that the sculptor was Leone Leoni, and the subject was the Genoese admiral Andrea Doria. Beneath the rim of the circular base, a marble cannon overlooked the harbour with an inscription on the muzzle: “Why do you hesitate to approach tiny boat? There is no fire in here, the shell is replaced by water.” Grandmaster Ramon Despuig (1736-1741) set up fishermen’s huts around the fountain. They sold fish from stalls which they accessed from doors set on the flimsy balcony overlooking the harbour; there they also hung nets and creels to dry in the sun. In 1859, Sir John Gaspard Le Marchant removed the Neptune to the Palace and replaced the fountain with a small, semi-circular basin with a central pillar topped by a neoclassical urn. The fountain remained in place until World War I.
Lascaris Battery, tunnel, inscription and the steps that lead to nowhere. 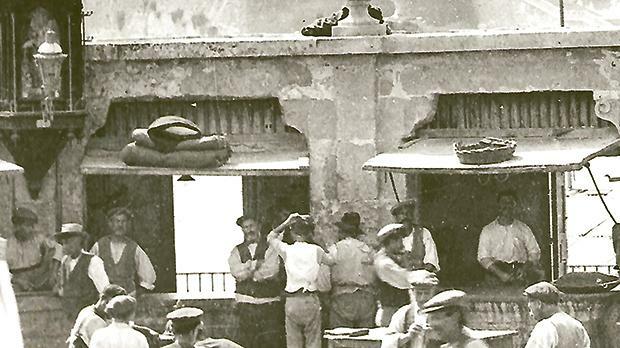 The place was a hub for commercial activity, where fishmongers and porters mixed, business was traded, and, after 1906, as the Valletta landing place for the steam ferries. 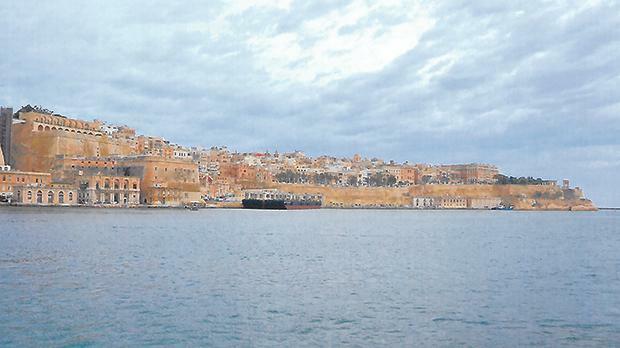 The Gozo boats and the Sicily ferries added to the general activity. There was the Austro-Hungarian Carola from 1896 to 1914, the Gleneagles and Princess Melita before World War I, the Knight of Malta and Ljubljana between the wars, and the Star of Malta in the 1950s. Some of the men lounging on the steps below the market would have been barcaioli (barklori), dgħajsa men, who vehemently, even violently, opposed the ferries which threatened their livelihood. The ferries shut down in 1959 and were resumed in 2012. The fish market became an eyesore; nothing came of the suggestion to: “dispose better the space between the semicircle, with providing marble slabs and tables”. It was closed down in 1937, was damaged during World War II and rebuilt, the former rooms being leased for shop and office use. In 1978 the circular base was buried beneath the new road. The Neptune fountain painted by Willem Schellinks. In 1853, Sir William Reid committed an act of cultural vandalism, which would have been excusable had it been, like the new dock in Dockyard Creek, an opportunity cost. The separation of harbour waters into mercantile and naval having been settled in 1851 by Sir William Parker, it was decided to construct a (perfectly useless) battery on the site of Lascaris Belvedere below St Peter and St Paul Bastion. It was meant to defend the inner harbour if the outer forts were breached. Paintings and the odd photograph confirm the destruction of a magnificent building, also known as the Delicious Corner, and La Favorita during the brief French interlude. Well-worn stone steps that now lead to nowhere recall access to the belvedere from the seashore. Memories of the area are recalled in the toponym Ġnien is-Sultan, overlying Ta’ Liesse church and Marina Hill, in the fountain by Francesco Buonamici (restored in 1987), and a small section of the original garden wall. If Reid had spared the belvedere, World War II would have destroyed it; Lascaris Battery was badly damaged and was not fully repaired until well after the war. Lascaris Tunnel was widened when the battery was built. 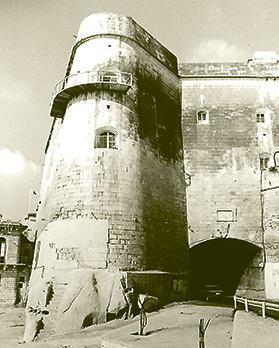 Travellers entered Valletta through Lascaris Gate and Porta di Monte; it is not clear if ‘Lascaris Gate’ meant the tunnel itself or to a gate at the entrance. Notches in the rock at the Customs House end of the tunnel suggest the former existence of a wooden barrier or gate. Midway in the tunnel is a small chapel originally dedicated to the Nativity of the Virgin; in 1900, Antonio Annetto Caruana referred to its foundation by a certain Borg when the tunnel was cut. There is now a 1901 plaque on the pediment, citing a 40-day indulgence by Mgr Pietro Pace to whoever recited a Salve Regina in front of the image of Our Lady of Mt Carmel. Antique images show a phallic-like column near the steps leading from the waterfront to the belvedere. This commemorated the munificence of Fra Giulio Amati, Bali of Venosa, who, in 1651, paid for the construction of a haven (Porto Pidocchio/Porto Amati – the flea port) for galleys. This was destroyed in a storm in 1686 but was rebuilt by Grandmaster Gregorio Caraffa. Galleys were repaired in the adjacent arsenal built in the great ditch below St Peter and St Paul Bastion by Fra Girolamo Salvago in 1652. It was abandoned after destruction by fire in 1685 (notches in the rock in the Barrakka Lifts camber reveal its former site). At right, the marble cannon below the balcony.